A chemical that has a median lethal dose (LD50) of more than 50 milligrams per kilogram but not more than 500 milligrams per kilogram of body weight when administered orally to albino rats weighing between 200 and 300 grams each. A chemical that has a median lethal dose (LD50) of more than 200 milligrams per kilogram but not more than 1,000 milligrams per kilogram of body weight when administered by continuous contact for 24 hours (or less if death occurs within 24 hours) with the bare skin of albino rabbits weighing between two and three kilograms each. A chemical that has a median lethal concentration (LC50) in air of more than 200 parts per million but not more than 2,000 parts per million by volume of gas or vapor, or more than two milligrams per liter but not more than 20 milligrams per liter of mist, fume, or dust, when administered by continuous inhalation for one hour (or less if death occurs within one hour) to albino rats weighing between 200 and 300 grams each. A chemical that has a median lethal dose (LD50) of 200 milligrams or less per kilogram of body weight when administered by continuous contact for 24 hours (or less if death occurs within 24 hours) with the bare skin of albino rabbits weighing between two and three kilograms each. A chemical that has a median lethal concentration (LC50) in air of 200 parts per million by volume or less of gas or vapor, or 2 milligrams per liter or less of mist, fume, or dust, when administered by continuous inhalation for one hour (or less if death occurs within one hour) to albino rats weighing between 200 and 300 grams each. Toxicology is the study of the nature, effects, detection, and mitigation of poisons and the treatment or prevention of poisoning. A toxicant is a toxic or poisonous substance. Toxicants may be chemical or physical in nature. Examples include arsenic, benzene, and radiation. A toxin is a highly toxic protein produced by certain plants, animals or pathogenic bacteria. Examples include snake venom and anthrax. All toxins are toxicants, but only those toxicants produced by living organisms are toxins. Substances that are toxic only to specific types of cells or organs are called cytotoxins. MSDS's are required to list is a material is toxic as well as the health effects that can result from exposure. Treat all toxic materials with great respect, especially those that are classified as highly toxic. Avoid their use whenever possible, but if you do you use them take responsible measures to limit their use and minimize hazards. Always wear appropriate personal protective equipment (PPE) such as gloves and respirators and utilize engineering controls such as fume hoods. OSHA's page on toxic and hazardous substances including recognition, evaluation, controls, standards and more. 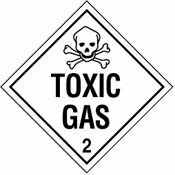 The U.S. Agency for Toxic Substances and Disease Registry includes information about risk levels, FAQ's about toxic substances and a list of the top 20 hazardous substances. Visit the Interagency Coordinating Committee on the Validation of Alternative Methods (ICCVAM) for the development, review, and validation of alternative toxicological testing methods. Environment Canada's Management of Toxic Substances Web Site. The NIH's Toxicology Tutor is a great resource for learning the basics of toxicology. Toxipedia is a wiki website with user-editable content on toxicology with respect to environmental and public health. The US EPA recently launched its ToxRefDB: Toxicity Reference Database which lets users search, find, and compare available studies on hundreds of chemicals from 500 public sources. Toxicology Basics, a PowerPoint presentation with handouts at the U of Arizona College of Pharmacy. Play Toxic Trivia here at ILPI. The American College of Medical Toxicology has forums, courses and more. The American Academy of Clinical Toxicology advances research, education, prevention, and treatment of disease caused by chemicals, drugs and toxins. See also: antidote, ATSDR, EPCRA, hazardous, poison. Get your handy DOT warning labels and placards at Safety Emporium.